Move Out the Old! 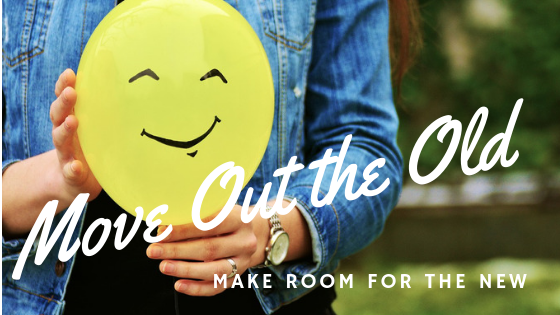 Make Room for the New! This year God is challenging me to move out the old and make room for the new. That means change! Even though I tend to be flexible and open to change, I like to know what change is coming. My husband is a fully certified “keeper” of all things that may at some point be useful for any unforeseen circumstances. He is a “fixer” — and an excellent one at that! I, on the other hand, am a “thrower”. I resist clutter with a fervency. If something isn’t serving a useful purpose, I am quick to give it away to someone who will make good use of it. We have learned the benefit of “keepers” and “throwers”. Did you ever try to take food from a toddler? Be prepared! What a child lacks in size they certainly make up for in resistance. Honestly, I feel the same way when I have to part with something I am enjoying! It is the “you will still be eating” part that has me a little nervous. The “new” at the end of the verse sounds perfect, but what will I have to give up before actually seeing and holding the new? “You will still be eating” implies the blessing of God in the preceding harvest was substantial. A harvest that was valued and appreciated! However, “still eating” also means I’m not yet satisfied, full or content with that proceeding blessing. “What blessings am I hanging on to? Before every new harvest, storage bins receive a thoroughly cleaning. Any remnant of last years harvest is removed, eliminating any opportunity for the old to contaminate the new. new wine into old wineskins. the wineskins will be ruined. “You have to” doesn’t exactly sound favorable either. Give me choice!, Show me the options allowing time to weigh and assess benefits. I can adjust with that! Add the words “you have to” and the dynamic changes! Change is awkward! More of my life than I care to admit is lived by learned behaviour! Adjusting to something new takes time and patience. Change costs! Want an example? My old computer stopped working; the new replacement has added features but was expensive. Change often carries an unseen price tag — sometimes financially, maybe relationally, or even emotionally. Change is a process! It is the undetermined span between the now and then, the here and there, that requires effort and time. This unknown discourages movement. Change awakens fear! What if it doesn’t work? Will it be worth it? What will people think? Change requires confidence and trust! When the change isn’t my choice, I need to have a deep trust of the one asking me to change. I need to know my best interest is considered or there is a higher goal or purpose for change. Some things I will gladly let go of, however. The sooner poor habits, destructive thought patterns, or nagging fear exit my life the more content I’ll be. Thankfully God attached a promise with the “have to”; it includes “make room for the new“. I am an expert at making room! We had five boys in just over eight years in a relatively small three bedroom home. Making room for one more created a welcome challenge. Now with family grown, we have downsized into a much smaller home. Over the years, I have become proficient at making the best use of even the smallest spaces. Just like I am unsure of what I may have to let go of, I am equally unsure of what God is asking me to make room for. These unanswered questions create tension, an uneasiness, that only faith in God can resolve. Not every harvest is prime quality or quantity on the Canadian prairies. There can be infestations of disease or pests, adverse weather like drought or hail, and any number of other issues that significantly affect the new crop. As a matter of fact, there is no guarantee the new crop will even be realized! Yet, God promises us new! It is virtually impossible to forget the “former things” when the flavour is fresh in your mouth. However, there will be no appreciation for the new unless we willingly release the old. Perhaps the reason change becomes increasingly difficult is previous experiences with both positive and questionable changes. Such resistance to letting go of something firmly possessed for something not yet visible is understandable. With confidence I step into God’s promise purposefully laying aside fear and comfort. Why? The One who promised is faithful! than I can presently see. I trust Him and His word! Not blindly, but fully! Faith is never blind! Though I cannot see what the future holds, I see clearly the God who holds my future. He never fails in His promise. find their Yes in him. Laying aside yesterday’s blessings, yesterday’s provision and yesterday’s anointing is for the sole purpose of taking hold of today’s increased blessing. I will never fully realize God’s best while stubbornly holding on to yesterday’s good. So I am prepared “to move out” all that is necessary “to make room” for what is ahead! It sounds like work! But I’ll let you know how God works it out!